If you’ve seen the 1978 Superman movie, with Marlon Brando as Jor-El, then a good part of this movie will give you déjà vu. Will Farrell doesn’t do a very good Marlon Brando impression, but then, it isn’t really supposed to be all that good. I don’t think so, anyway. Will Farrell was actually quite bearable, that’s the point. To start with, the galaxy is destroyed. Well, some portion of some galaxy gets destroyed, at least. Two sets of desperate parents each save their son by putting him into a fancy escape pod and sending him out into the depths of space. That’s never seemed like a very good idea to me, but it’s part of the mythos now, so you just have to roll with it. One baby is blue, hapless, and confused; the other one seems to have everything all under control as he’s hurtling into nowhere. He even looks good while doing that. One baby lands in the middle of a wealthy, childless couple’s house and is an instant hit. The other baby lands in… well, let’s just say that this kid looks out at the world through bars other than those on a crib. Guess which one is voiced by Brad Pitt (Ocean’s Thirteen) when he grows up, and which by Will Farrell (The Other Guys)? The rivalry is instant at school — no surprise, really. Handsome Brad Pitt Little Boy has already made everyone his friends by doing tricks with his Superman powers, and poor Big-Headed Blue Will Farrell Little Boy has to jump in at the middle of the semester and be the smart kid who’s no good at sports. You know, if I was just better at building death rays, I would’ve become a supervillain myself. I had no idea how close I came. Good thing I’m not blue or bald. Anyway, if they have other names, we don’t get to hear them. 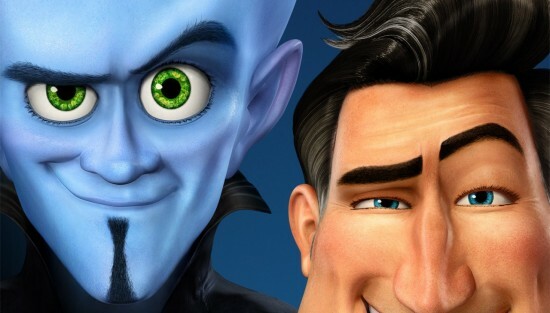 They’re Metro Man and Megamind, and proud of it — even though neither one is all that likable, really. Metro Man, guardian of Metro City, juggles babies and calls the citizens helpless, yet they love him. Not that Megamind is any better. He and his faithful minion, Minion (David Cross), a talking fish with a really bad underbite, spend all their time robbing banks, trying to take over the city, and kidnapping reporter Roxanne Ritchi (Tina Fey), who should not be confused with Lois Lane even when she’s being scooped up from her balcony for a nice flight around the city. Then Metro Man is no longer around to protect the helpless Metro Citians, and just in time, too. The whole walking on water thing was getting pretty old. Megamind takes over City Hall while everybody watches — helplessly, of course — and evil wins the day! That isn’t the entire movie, though. I wouldn’t tell you the whole plot. That’s just where the movie takes a weird turn. The whole good-evil thing gets kinda fuzzy, first of all, and Roxanne’s love life gets a little complicated when Titan (Jonah Hill) arrives on the scene. Or maybe I mean Tighten. I assumed it was Titan, since that’s a good code name, but when I looked at the credits on imdb and the official web site, it was spelled Tighten. The character spells it Tighten, but I wasn’t sure if that counted since he wasn’t supposed to be the brightest bulb on the tree. It may be a copyright issue. Then there’s the invisible car, the warden (J.K. Simmons, Spider-Man 3), the Tesla coils, the brain bots, and rampant destruction of city property. There’s even first dates, first kisses, and a little existential angst for good measure. Yes, this is a movie for kids like Shrek Forever After is for kids, which is to say not at all, really. But it was fun. Apparently even Will Farrell has a niche where his acting… or lack thereof… is okay, and here it is. Heck, I didn’t even cringe about Ben Stiller doing the voice of the depressed Bernard, who’s a librarian or museum curator or something. So I’m a little shocked to be ranking this four and a quarter out of five. I don’t know if the kids in the theatre understood it, though. Some of them seemed a little restless at times. Yeah, that is weird, but that was the impression I got. The point is, the writers had a lot of fun messing with all the usual clichés and mixing everything up, and you can tell they had fun. Again, I’m not sure they really reached their intended audience, but they entertained me just fine.